PILATES Tone/stretch to the max! TRIATHLETES Maximize swim, bike, run! TENNIS Develop endurance, prevent injury! ALL SPORTS Jump higher, run faster, move quicker! BODYBUILDING Loosen tight muscles! Tone up! Get bigger! GYM/FITNESS Stretch further! Maintain elasticity and strength! 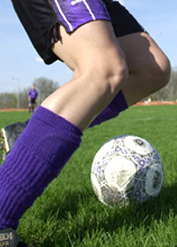 Tissue Vacuomobilization is gaining popularity among the sports world arena for its performance enhancement. 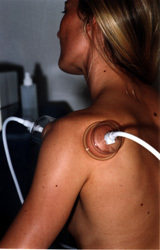 This massage technique uses various suction discs, stetching the muscle tissue against its own resistance. This non-invasive procedure stimulates the natural function of the body (arterial, venous and lymphatic) while promoting better exchanges at the cell level, increasing metabolism to include elimination of lactic acid and toxic wastes, increasing resiliency of the elastic fibers. OPTIMAL PERFORMANCE IS PROVIDED BY THE TV10 SPORT BY RELEASING MUSCLE’S STIFFNESS, D.O.M.S. (Delayed Onset Muscle Soreness) AND ELIMINATING LACTIC ACID. Structural stiffness occurs when a tissue looses elasticity. Scar tissue within a ligament, for example, may be as strong as or stronger than the ligament itself, but will not be as elastic and will not respond to stress in the same manner. The resurgence of therapeutic treatment in the area of sports reflects the need for effective soft tissue therapies that promote systematic homeostasis and nurture the desire for non-threatening intervention. Restoration and rehabilitative sports massage is for the chronically injured athlete, or for fresh injuries in the rehabilitative stage. Eliminate areas of stress in adjoining, surrounding and antagonistic muscles where areas are created to compensate for an injury. Help maintain homeostasis of muscle in the best possible state of vitality, which will aid recovery, and enable the injured area to function well.